professional, prompt and always such a delight to work with. Beautiful, clean and nicely done! Good pricing. Always shows up on time, and looks great! Good pre-production contact and service. Timely shipping. Great printing! Love the quality and quick turn around! Knowledgeable staff with great communication! Great quality products as well! Printing Center USA is our go to for all our marketing materials! Quick service! Brochures look great! Way better pricing than our previous supplier. Highly recommend!! Perfect as always! :) Fast, great quality, and excellent customer service. Quality Production and Great Service every time. Excellent service, quality, and prices. Thank you! I have been using printingcenterusa for the last 3 years to print our brochures. Their website is easy to use. They have a quick turn around, the paper and print quality are top notch. I was very pleased with the quality of the menu's we had printed. Everything looked perfect and the paper was of very good quality. Easy to work with and will use you again. Awesome as always. This company has great customer service! It was a pleasure to work with Alexa at Printing Center USA. Their service is prompt and excellent. The quality of the printing is exceptional for the tri-fold glossy color brochure we ordered. They were also great with the complexity of our shipping requirements and are more than willing to bend over backwards to meet our requests. Turnaround time and shipping time information were very accurate. Everything was printed exactly as ordered, and delivered on or before the date promised. I will definitely use this company on a regular basis! Our group will be doing more work with Printing Center USA. They have always been extremely helpful. We find their website easy to navigate. There are many options to choose from and they always make sure to communicate with us. We love the service and quality of product. Quality product, delivered as promised. This is our 3rd order from PrintingCenterUSA and we have had a great experience every time. excellent service, and extraordinary quality product with a great price. Could not ask for anything better. I initially order some brochures on Staples - never making that mistake again, the print was awful quality, just terrible. It was nice to see a quality work for a change. Great job as usual! Thanks for all your gelp and shipping to Hawaii at a reasonable rate! Smooth through entire process. Quality product received. Great service and quality every time! Thanks! I was very pleased with the quality of printing. Our company has used them for 10 print jobs to date and we will continue to use them. The contact person there is great and easy to work with. Printcenterusa took time to help me ensure my project came out perfect. It took special help as I never made a brochure before. They help make sure the bleed area was correct and the color came out right. Special Thanks to them and I will definitely use them on my next project. The service I received was fantastic! The print quality was even better! And the pricing was what made me go with Printing Center. As long as all of that stays the same, I’ll be back in the future! Easy to order and they look great. Good printing. Color matching a little off but not bad. My 10,000 copies were two days late but the manager made it right with me by giving me a break. The service was excellent! No issues with my brochures they were perfect and they were a bargain compared to everyone else we contacted. Could not be happier and will be coming back. Have used them for 15 years--always perfect. So happy, from initial inquiry by message to proof, through quality, yeah. The finished product arrived before my deadline and the brochures are beautiful. Will surely use printingcenterusa.com for the next project. Friendly, knowledgeable, kind and helpful - a remarkable group. I familiar with the quality from previous orders but Mike McGregor went out of his way to ensure a timely arrival of my shipment. I can't stress enough how helpful he was. Thanks always! Outstanding product, price and service! I made a mistake on my order form but was contacted immediately to clarify the order. The proof came shortly afterward and then prodcution time was shorter than anticipated. I received our order 10 days early and they look great! Thank you! Our flyer order was handled very well and the folks at Printing Center USA helped us with some adjustments to our graphic to make sure that nothing was cut off. We received the flyers when promised, and they look beautiful. Melissa was very helpful in getting me a timeline to follow for our HCE Annual Meeting Booklet. Thanks a lot! This is our second order. We loved our calendars and the brochures just arrived today. They are beautiful and we are thrilled with the quality. We will always use PrintcenterUSA for future collateral. Always top-notch products and service! Our company has recently begun using Printing Center USA for all marketing collateral and without exception the materials are timely processed and printed in vibrant colors on high quality materials. The process is simple to order and receipt of completed collateral is quick. I highly recommend Printing Centers USA at printingcentersusa.com. We received our finished product on time. The quality of the brochures and booklets were great. The quality of our photos and overall colors were richer and more vibrant than materials we had done through another printing company. I will definitely be ordering all of our print materials from your company in the future. Thank you!! Excellent customer service, excellent printing! Our brochures are beautiful. I highly recommend PrintingCenterUSA for any of your printing needs. thank you for making a short run of 4 over 4 color printing affordable! the print quality is stunning, customer service is beyond reproach, i will recommend you to everyone. i work for a very large corporate network out of minnesota and even with my employee discount i can not afford the printing and your service and quality is as good or better. thank you press person and customer service. i am a graphic designer and have been dping prro bono work for a cat rescue in ohio and they a beyond thrilled and i can afford to have the pieces i design for them pinted. My brochures are amazing! The print quality is outstanding! when placing my order, I had missed the box to add folding, with a quick call I was able to get that added on and they made it so simple! I have had many different items printed by Printingcenterusa and they always exceed my expectations! Great brochures and speedy delivery! first time i used this firm, my client has rec'd the job she gives them 5 starts and so do i. i will use them again. Great product! Will use again. The best customer service you will ever get. Above and beyond - thank you. Thank you for the amazing customer service! Mary was very easy to work with and extremely helpful. Will be using printingcenterusa.com again in the future. The brochures turned out gorgeous. Quality paper, quality color, and arrived in plenty of time. Thank you Printing Center USA! I was very pleased with the way my wedding programs turned out! They looked so professionally printed. I would definitely order from them again if the need comes up. The product is exactly what I expected it to be! I have used Printing Center USA for the last few years for many different projects and will continue to do so! They have great quality work, good customer service, and amazing production and shipping timeframes! Amazingly surprised on the high quality output and fast turnaround! So much less expensive than a local speedy printer! Reliable seller, good, cheap and high quality item, quickly shipping to my USA postal address and from there to my country Costa Rica. Woderful experience printing abroad. Also, very well packed. Very helpful and nice to work with over the phone and online. My flyers arrived on time and the print job was perfect...thanks! As before the finished product was all that I expected. Good Job! We are very pleased with how they turned out. Emily was very helpful to correspond with. Thank you. Such helpful staff! It was my first time designing and I needed some pointers ... and got them. Thank you SO MUCH, everyone at PrintingCenterUSA! Brochures turned out great! Just as expected. Shipped quickly, too. Would order again. 3rd order for our annual buying local guides. Very pleased with the ordering process and quality of the product. I love my brochures! They are exactly what I wanted, high quality and super easy to order and work with. Great quality & value for the price. Print quality is as good as I've gotten from local print shops for much higher cost. Proofers really looked out for us as well. Letting us know our design was just a little bit off on the fold alignment, giving us the opportunity to fix it and re-upload. Resubmitting our files did delay the production several days, a bit longer than I expected. We weren't on a time crush so it did not have a negative affect. Excellent quality with first rate service. These were nice brochures; more information on directions and styles on the website would be nice. I've done several Print jobs with PrintingCenterUSA now and all of them have been done professionally. They continue to impress me. Thank you for the great Work. Just received the second of two recent orders and am very pleased with the quality and color reproduction. Service was excellent. Will definitely recommend Printingcenterusa to others, and will be back when more printing is needed. Thanks for a great job. I am very satisfied with my order from Printing Center USA. The entire process was easy from start to finish, and Lynn and Melissa were helpful throughout. The brochures arrived as expected and look great! I will definitely be using them for any future needs. The final product was exactly what we wanted and was delivered in a very timely fashion. Plus the price was very competitive. We have printed calendars, booklets, posters, brochures and rack cards all through Printing Center USA and have been extremely satisfied with all. And when we need to call, we reach a REAL person who is polite and professional. Thanks. Great Product and Great Customer Service! We could not ask for more. The brochures arrived in great shape and looked as expected. Thanks for keeping the price reasonable. Great products! First time I used PrintingcenterUSA and they did a fantastic job. Writing is perfect, paper stock is nice. It was completed, shipped and arrived on schedule. I will be using them for more print work. Prompt, inexpensive, helpful, and high quality. Very pleased. Our brochures are perfect! Super fast service and great customer service. Thank you so much! We will be ordering more from you in the future. Software was easy to use -- lots of great options! Staff was very cordial and helpful with any issues and I appreciated the tip that my photos were not the correct resolution for a good print. Final product is excellent and at a very reasonable price. Great service! Their prices are consistently the best and usually orders are delivered correctly and on time. However, if there is ever an issue, the customer service I've experienced is very slow in responding and a bit rude. Great quality, price and quick turnaround. This is my second time using Printing Center USA and I will keep using them. First time making a company flyer. I was a bit nervous. I used the template of the Printing Center USA site. That made it super easy. I uploaded the files and even talked to a rep at the location just to clarify that I did it right. They were so helpful and making me feel comfortable. The finish product arrived and it looks awesome. thank you so much! definitely use them again and again. Fast, cheap, but having to use JPG instead of PDF means quality not the best. Very happy with the brochures. Perfectly done, good service, arrived on time. Glad to have found Printingcenterusa! Flyers look wonderful and we received them sooner then we thought. Easy to use system, great service, excellent product, wonderful price - what more can you ask for. Excellent service and communication throughout the entire process and the quality of the brochures we ordered was wonderful. I would recommend Printing Center USA to anyone looking for a company that offers high quality prints at an excellent price. Loved how the brochures looked. My customer service rep, Mary was very helpful and professional. I asked for my shipping to be expedited and it was taken care of immediately. Will definitely be using this company for future marketing needs. I love the brochures! Not only was the price the best I found on the internet, but the quality was also great. I will purchase from Printing Center USA again. The booklets were as designed and accurate to the color profile applied. American Legion Windsor Post #82 will use Printing Center USA again. Excellent work! This company is the worst. Zero communication. Incorrect billing. We've had many problems over the years and this order was the final straw. Never again. Every organization needs to share information and brochure printing is the way to do it. A brochure is a quick and resourceful way to transfer information about products, events, and procedures basically any piece of information can turn into a brochure. Brochure printing services enhance any marketing, advertising, educational, or fundraising effort. Brochures are ideal for distributing information about products and or services, answering common questions, used as Direct mailers and perfect for Counter top displays or in store handouts. Digital printing has allowed the print buyer to buy color brochure printing in smaller quantities and cheaper printing prices. Now print buyers can change the full color brochure design and copy to suit their current print marketing plan. Utilize easy and affordable EDDM Saturation Mailing. The turnaround time is much faster, often the same day or overnight, because your electronic file goes direct to the digital printer and is ready to print. 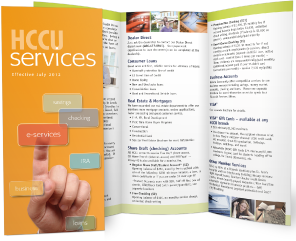 Dozens of businesses use short run brochures as printed marketing tools because they are able to convey a lot of information about their products or services in a small space. These short run printed pieces could either be mailed to consumers or kept on display at high-traffic locations, such as grocery stores or shopping malls, enabling organizations to reach a broad audience. For smaller firms, short run brochure printing may be the most cost-efficient way to produce leaflets. Short run printing takes advantage of digital presses to manufacture small volumes of color brochures with little additional costs. Short run printing enables companies to make a limited number color brochures, and it gets the job done in a timely fashion - perfect for supporting an upcoming event in a marketing campaign.